Academic blogging is gaining popularity among academics, who now use it effectively to communicate their research to a larger target audience. Blogs encourage public engagement and also enhance the impact of content. This blog aims at imparting useful information on how to write an academic blog, common mistakes to avoid while writing one and also offers samples to be referred to when in doubt. How to write an academic blog? Academics cannot help but agree that blogs add value to traditional methods of publication. Publishing is a long process if done traditionally, can take up to two years to be completed. Blogs, on the contrary, encourage immediate engagement of audience and debates on current issues. When you write a blog for the first time, it is often difficult to attract readership. You can help readers find your blog on the internet by using SEO Tools efficiently. You can also write on current issues and invite comments of eminent personalities and international peers, to enhance visibility. Your subscribers look forward to your blogs, make sure you don’t keep them waiting. Decide on how regular you can be with blogging and then ensure that you stick to it. Most academics post one blog per week. 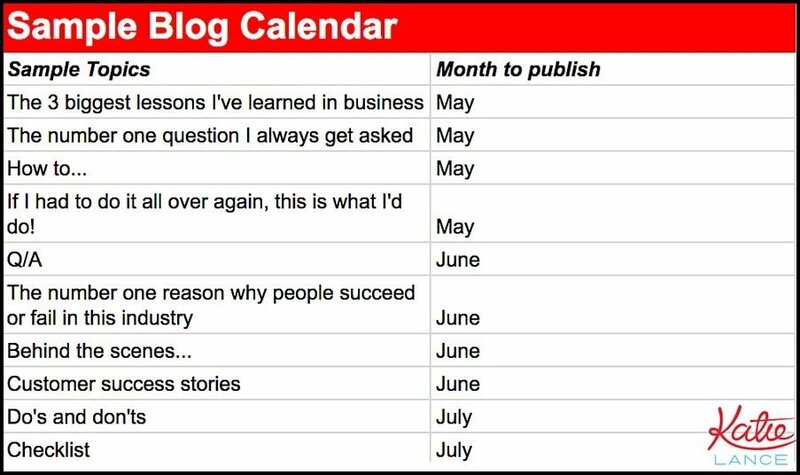 However, if writing a blog a week is too tedious a task for you, then instead of posting 4 blogs in a month and then posting nothing for the next 6 months, it is recommended that you post one blog a month. In order to attract readers, make sure that your blog opens with a catchy headline. The headline may include a question, a controversial remark or even a quote! Just read the headline and ask yourself if you would want to read the blog going by its headline. The formula for writing good headlines is given here. The credibility of your work can be enhanced by including guest blogs in your own blog from time to time. This provides authenticity to your writings and also saves you some time and work. 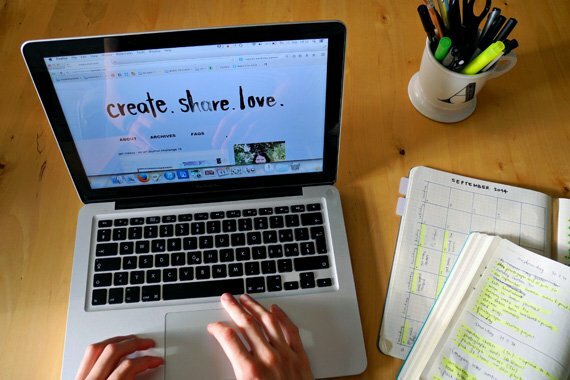 Since you are new to the world of blogging, it is your own responsibility to share your blog on social media websites and ensure maximum visibility. Encourage peers to share your work on websites like Facebook, Twitter and Google+ to reach a larger audience. Before you publish content for the rest of the world to read, make sure you are certain of every word you write. If you copy any content from anyone else’s work, make sure you give due acknowledgement. Do not cause any infringement to intellectual property. What does a teacher want from an academic blogging assessment? Blogging assessments help teachers assess students on various parameters. Weight-age is given to different facets of a blog and students are graded accordingly. The major difference between assessing written assignments and multimedia activities such as blogs is that with the latter, the use of videos, images, hyperlinks and colorful text makes the assessment relatively simpler and more effective. 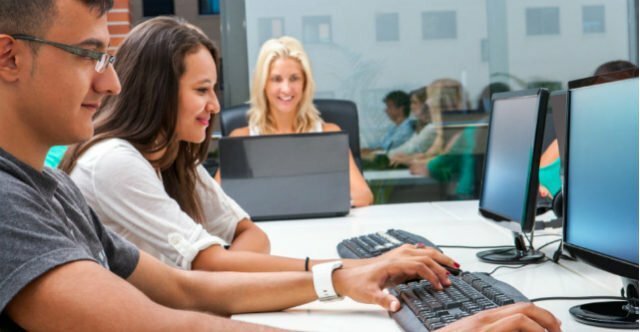 The feedback can be shared with students as well as among the entire staff fraternity, making it easier for students to acknowledge and rectify their mistakes. Blogs assignments can be done in groups thus encouraging collaborative thinking. Peer assessment also helps students reflect on their own work vis-à-vis the work of fellow mates. Blogs often have standard templates that ensure uniformity across the works of all students. Past blogs of students can also be recorded to observe progress over a period of time. Real time feedback can be given and can be left open for comments. Blogging also helps students become experts of subjects through constant sourcing and filtering of information. Blogs let students take ownership of their work while they explore diverse perspectives of learning. 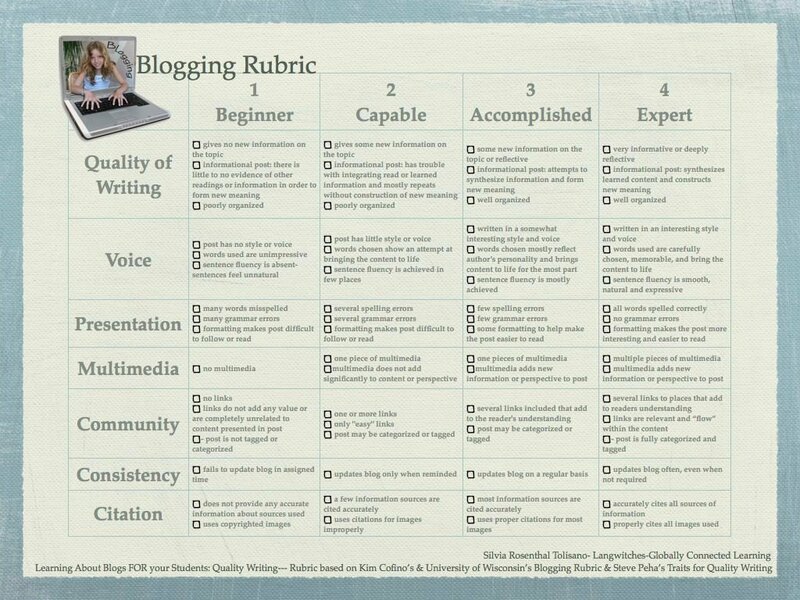 A rubric is created by teachers for evaluating students on the basis of blogs. The assessment parameters are usually content and creativity, “voice” of the blog, use of multimedia, timelines, tags, quality of content, citations, proofreading etc. The weighted average of these scores is often considered for evaluating students based on their blog assignments. The blog neatly compiles relevant information under subheadings. The appropriate use of images and graphs further corroborates the findings of the team. References are also stated towards the end and the questionnaire used for research is attached in the Appendix. The blog is updates on a regular basis and is well equipped with informative content and pictures to keep the readers engaged. The catchy headline makes parents want to read the blog. The writer uses the picture of a stressed child to lay emphasis on the topic in discussion and also to gather attention from parents worldwide. This blog shows how colorful text can be used to attract readers. It displays a personal liking of the writer. However, the readers feel connected due to the topic in discussion. WWE being an area of interest of millions worldwide helped garner the attention this blog deserved. This is not a hashtag but a blog which highlights student life at a University and gives potential candidates all the information they might need. While completing a blogging assessment is not a herculean task, maintaining consistency while writing blogs certainly is. Hence, it is of utmost importance that you do not take blogging as a task, but as an activity that helps you derive pleasure. This entry was posted in Academics and tagged Ultimate Guide to Write an Academic Blog. Bookmark the permalink.